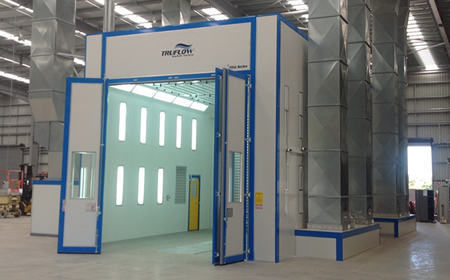 Other Industries – Bus Spray Booths , Large Equipment Booths, Semi Trailer Spray Booths, Train Spray Booths. How do I choose the type of Truck Booth I need? 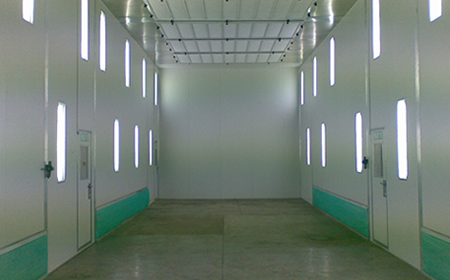 When choosing a Truck Spray Booth you have a few choices to make. 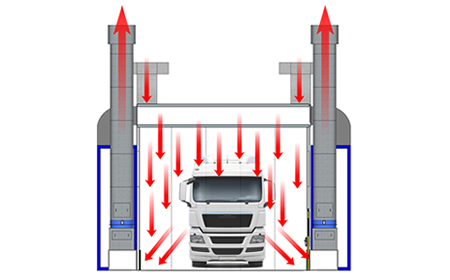 There are a multitude of available airflow configurations, each with their own benefits and performance criteria. 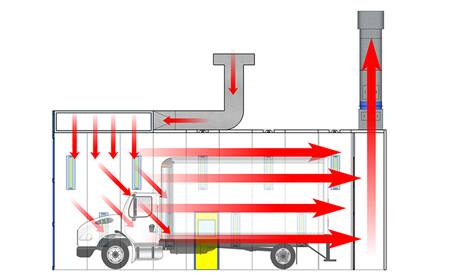 These four major types of airflow design are explained below. 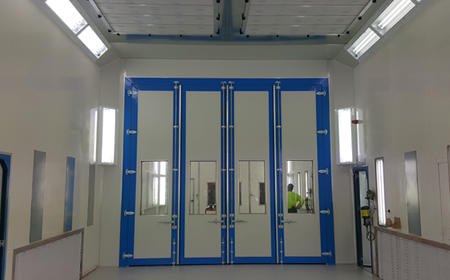 Size of the spray booth is another factor: due to their operational purpose they do inherently take up a considerable amount of workshop space. 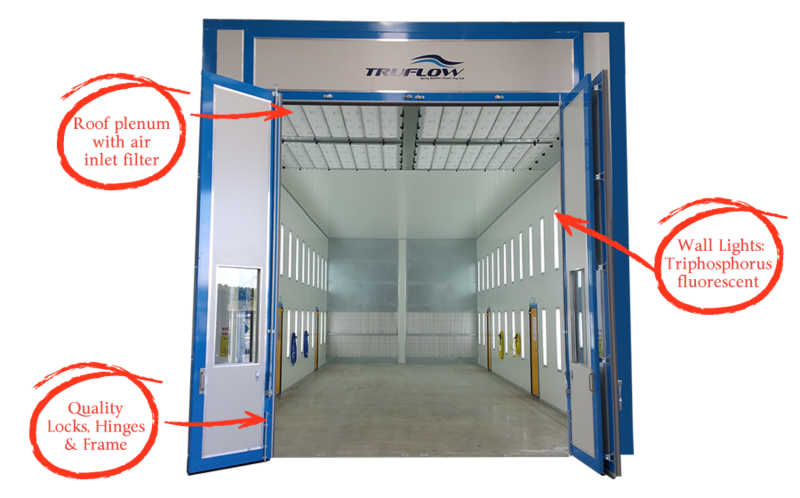 For this reason TRUFLOW has designed all of its floor mounted machinery to be as compact as possible without affecting performance. Of course for a bit more expense roof mounting machinery is an options. By placing machinery onto the roof you will save valuable floor space costs in the long term. Installed complete with a structural platform, safety handrails and service access ladder a TRUFLOW system provides full compliance and safe access. Externally installed booths are also an option ( although typically the most expensive). 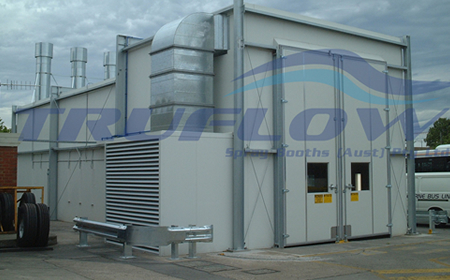 TRUFLOW has provided external spray booth installations and these installations typically require weather protection covers as the spray booths themselves do not constitute a building ( they are plant and equipment) so planning is essential. 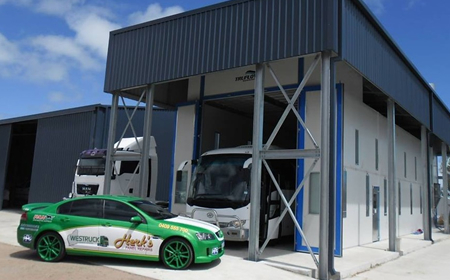 Regardless of the option you choose our experienced team is ready to help guide you through the entire process. 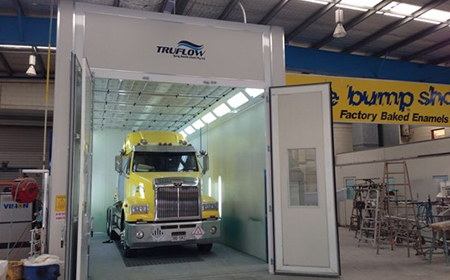 Crossflow Spray booths are a ideal solution for workshops looking to economically paint large equipment and trucks. Suitable for all types of re-finishing applications this range is an economical purchase in virtually unlimited sizes. 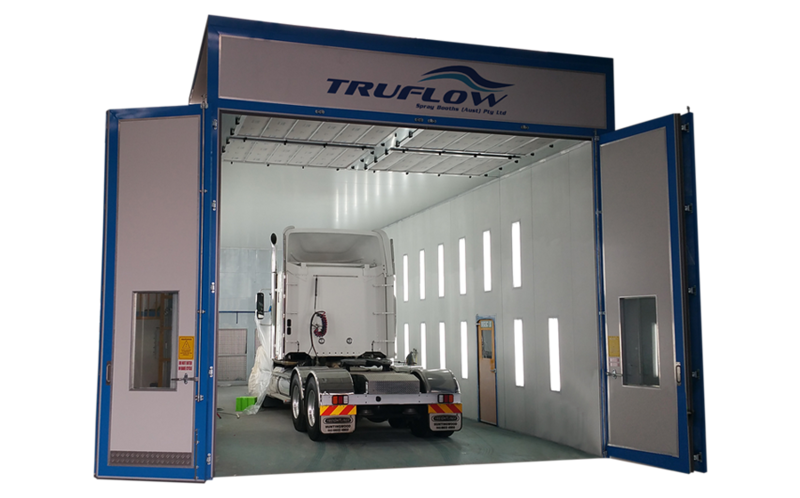 A Crossflow spray booth is by far the most cost effective Truck Spray Booth and provides a solution which takes up the smallest factory footprint. 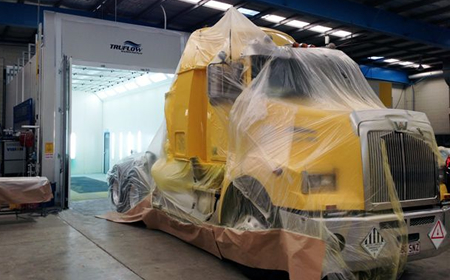 The cross flow is the most popular solution for Truck Spray Painting. Enclosed Cabin with many lighting options. The reference to Semi Downdraught comes from the “push and pull” design of this booth. The air is delivered via a supply fan partially through the ceiling of the booth. This air is filtered and provides the you with the option of heating as a standard feature or a future upgrade. 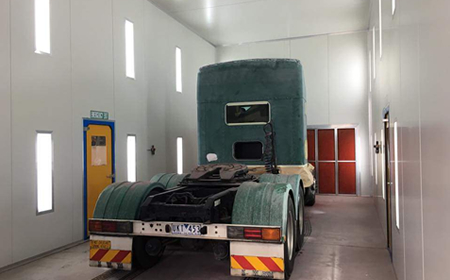 For this reason the Semi Downdraught is a very popular choice in the Truck re-finishing sector where heating is required and a quality finish is desired in a very economical package. This system has been successfully used for painting trains, buses, coaches, wind towers, mining equipment and even aviation components. 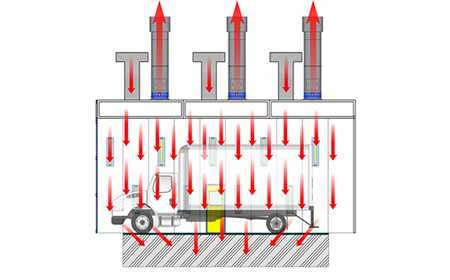 Semi Downdraft is the most popular solution when requiring heating. Standard Heating or Easy heating upgrade in the future. 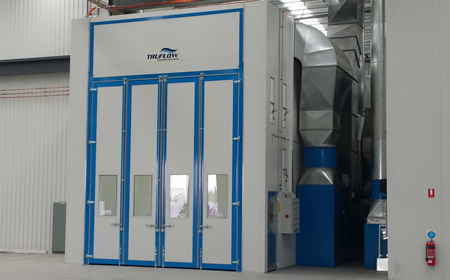 Inlet air plenum provides cleaner environment when compared to crossflow. The airflow is introduced through the entire roof plenum mounted in the ceiling of the booth and is extracted low on either side wall or rear wall. This method is also commonly referred to as “full” based on the roof filters running the full length of the roof, not just partially like in a semi downdraught. These booths are custom designed and constitute a amalgamation in design principles. On Floor Downdraught with side or rear extraction can be installed without concrete works. 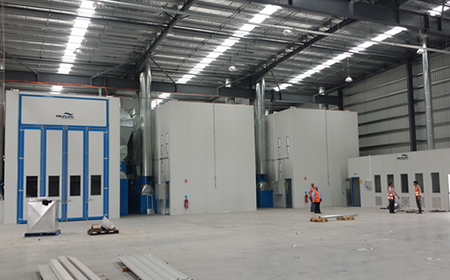 Industry Benchmark as best airflow method without concrete works. Ventilation through side walls (low) & no expensive concrete works required. 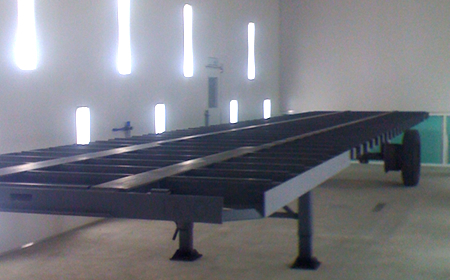 Machinery can be floor or roof mounted: This design of booth does have a large footprint. 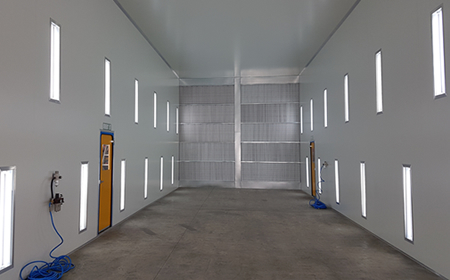 The in ground pit full downdraught delivers the industry benchmark of paint booths for Truck and large equipment spray painting applications. This airflow method provides the best airflow pattern with all over-spray directed underneath the painters feet ( pulled through the floor) irrespective of where the painter is standing. With this single pass design the booth provides superior cleanliness and quality of finish. The “full” refers to the entire roof plenum being supply air filters and the “pit” refers to the underfloor concrete works that provides the exhaust plenum ventilation. Full Downdraft with pit provides the ultimate in cleanliness and airflow efficiency. To heat or not to heat - that is the question. Why should I get heating? 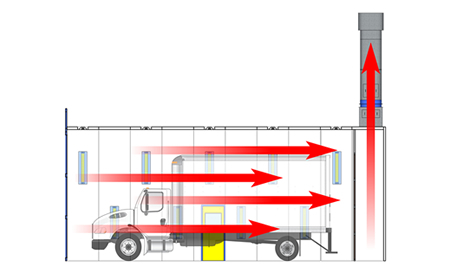 A key decision when deciding on what type of Truck booth to install is heating. The most compelling reason to add heat to a spray booth is increased adhesion quality during spray cycle and accelerated curing in bake cycle. Adding heat is all about increasing throughput, reducing the bottle neck by waiting for paint to dry and increasing adhesion quality of your spray by having a warm sub-strait for applying paint. 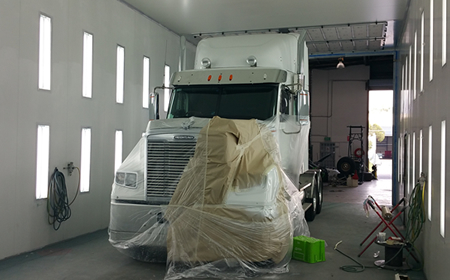 By adding heat to your spray booth you are controlling the environment in which you apply paint far more accurately. 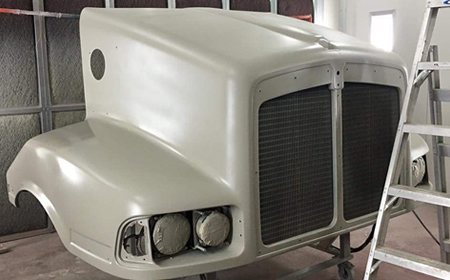 The ideal temperature for applying paint to a substrate (truck or part) is 20-30.C to ensure proper adhesion and uniform thickness with no runs. 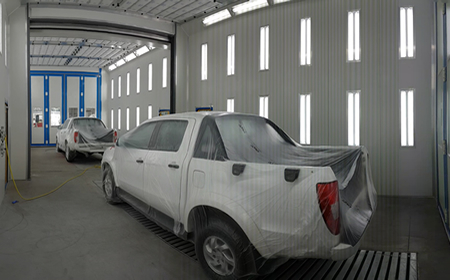 If the substrate is too cold (such as in a non-heated booth particularly on a cold morning) the paint coating is much more difficult to apply and it could cause the adhesion to fail immediately requiring reworks or over time resulting in a poor quality end product. Heating is a must if you plan to paint at any time of the day and if you don’t want to be controlled by the seasons. If no heating is fitted – its all about timing. Great coatings can be achieved in non-heated booths it’s just one time consuming. You need to pick a warmer part of the day so that the air coming in is not too cold, and you also need to mix the appropriate hardener / paint ratio to ensure the paint can cure in the colder environment. 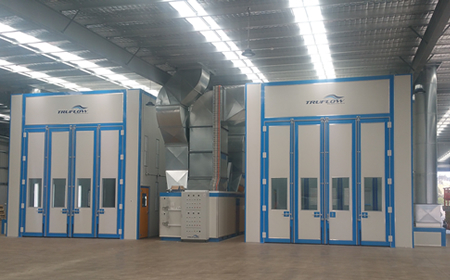 If volume production is not your concern then certainly non-heated booths suit your application, but if you want volume production and flexibility to paint any time in a controlled environment then heating is the best way to go.